Throughout history different gaits have helped horses to survive. Gaits with different beats and speed have provided ways to escape from predators and travel long distances. 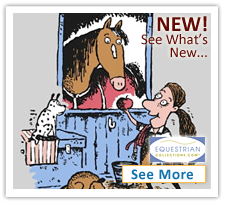 This overview outlines the most common gaits along with those exclusive to particular breeds. Walk is a gait most often used. It is four beat and in dressage it is the basis of any fundamental training. A walking horse can typically reach a speed of approximately four miles per hour. The next gait is the two-beat trot. An average horse will usually trot around eight miles per hour but unlike canter and gallop, an able-bodied horse can trot for a considerable length of time without having to stop. Trot is the basis for higher level dressage movements such as passage. Canter is a three beat gait with an average speed of about 10 to 17 miles per hour. When a horse extends its right front leg further than its left, it has taken the right lead. This basically means that the horse is slightly more balanced to the right. Thus most horses usually pick right lead when moving clockwise on an arena and left lead when moving counter-clockwise. Performing counter canter requires more balance and collection from the horse. When a horse is doing flying changes, the rider is asking it to switch leading legs at regular intervals. This is one of the more advanced movements in dressage competitions. Gallop is a faster version of canter but unlike canter, it is four-beat. It is most commonly seen in racing and average speed varies between 25 and 30 miles per hour. The less common gaits include pace which is a type of trot. A pacing horse will move two legs on the same side together usually achieving higher speeds than trot. Other uncommon gaits include the so-called ambling horse gaits which are usually faster than walk and trot. There are several ambling gaits such as tölt, running walk and fox trot. These gaits are usually linked to a particular breed and not all horses can perform them. In this overview we have outlined the different types of horse gaits. The aim of most training with riding horses is to control the tempo and speed of gaits. Performing these variations such as extended canter is down to the right balance of a horse and its rider.